Black Electric cigarette clasp case. Buy UK NUCIG. The case is ideal for keeping ongoing nucig, spare battery and spare filters. One small criticism:the elastic designed to secure the contents is placed such that it does not really hold the spare battery safely so don't open the case too swiftly! Only problem is when you got the complete battery and cartomizer in the case it comes very close to both sides of case and even to this fact the case keeps popping open. If not for this problem it would have 5* rating. 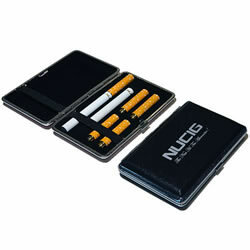 NUCIG REPLY> The case is deisgned to hold your kit securely in place. The place holders are a snug fit - simply push your items into the place holders as far as they go - this should fix your problem.